Gravity East Village brings on the heat offering private Infrared Sauna sessions in NYC! Our skin is the largest elimination organ of the body. Sweating is fantastic in that it opens up the passageways of the skin and allows toxins to release freely. Infra red saunas are specially designed dry heat saunas for deep cleansing (esp. of heavy metals). The infrared rays (not to be confused with ultraviolet rays) penetrate the body up to an inch and a half deep causing the liquid within our cells to vibrate, shaking free bonded toxins and allowing them to flow out into circulation and away from the tissue. This internal heating also stimulates the immune system and increasing the production of white blood cells and anticancer proteins. There are benefits to using an infrared sauna over a regular sauna. You will flush out toxins. You will sweat and this helps to flush out toxins from the body that reduces toxic overload. With an infrared sauna the sweating is deeper and more profuse, enabling your body to excrete a higher percentage of toxins than with a conventional sauna. Infrared saunas run 20-60 degrees lower, making it easier to tolerate the heat which makes it more comfortable. During your sauna session, you will stimulate better blood flow and circulation throughout the body. This can lower blood pressure and help to relax tight muscles and ease minor aches and pains. Enjoy drug-free pain relief if you have arthritis or troublesome muscle or joint pain that helps reduce stiffness and inflammation. Weight loss. Yes, you will sweat out some ‘water weight’ during a sauna session that you will restore when you re-hydrate. 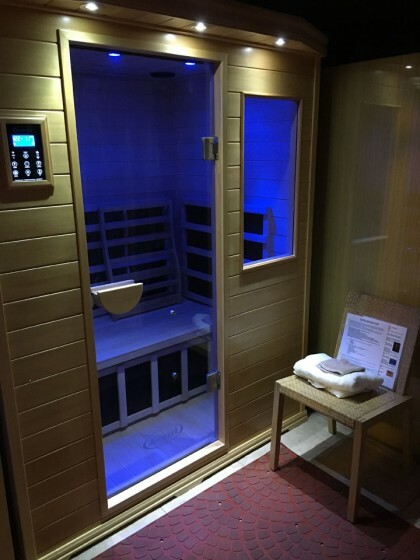 However, there is evidence that infrared saunas, because of their ability to penetrate the skin more deeply, increases the metabolic rate and can help the body burn off anywhere from 200 – 600 calories in a half hour session. A regular sauna session will not melt away tummy fat, but with a healthy diet and exercise can give your metabolism an extra boost while you are lounge and relax. For our price list, please go to our FAQs page.